Kathleen Nolan (born September 27, 1933) is an American actress. She was known for her role as Kate McCoy, a housewife in the Walter Brennan series The Real McCoys. Nolan was born Jocelyn Schrum in St. Louis, Missouri. 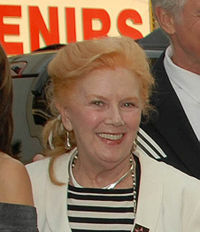 Nolan became the first female President of the Screen Actors Guild (1975–1979, two terms). She is a life member of the Actors Studio. ↑ David Garfield (1980). "Appendix: Life Members of the Actors Studio as of January 1980". A Player's Place: The Story of the Actors Studio. New York: MacMillan Publishing Co., Inc. p. 279. ISBN 0-02-542650-8. This page was last changed on 22 April 2019, at 17:00.